Things have been getting very complicated in the world of jailbreaking over the last week or so. We had the initial excitement over the Evad3rs iOS 7 jailbreak, then the downer when people realized that it installed a suspect app store on Chinese devices. Now we’re back into warm glow territory as Evad3rs explain their position and ditch that app store entirely. Now, finally, we can concentrate on the task at hand – getting some tweaks installed. Unfortunately, as Saurik’s MobileSubstrate hasn’t been updated to fully support iOS 7 yet, there are a few issues to be seen. For instance, many jailbreak tweaks disappear after the device is rebooted, while others simply never take hold properly after installation. Obviously with the idea of a jailbreak tending to be to allow people to install third-party tweaks so that they can customize everything, this is a bit of a pain in the rear. Saurik being the all-round awesome guy that he is has already posted his thoughts on the situation, with a Reddit thread playing host to his words. His stance is that users should wait for him to get an update out that will fix the issues instead of using unofficial fixes like "MS Reload fix", and he says that won’t take too long. It is Christmas after all, so we’ll forgive the guy for not having it ready in double-quick time and we’re sure you will too. However, less patient types have been finding ways around the problem, and Saurik says that they’re risking causing themselves problems by doing it. However, one Reddit user appears to have found a fix that even Saurik believes is safe – mainly because it’s what he intends to do himself. 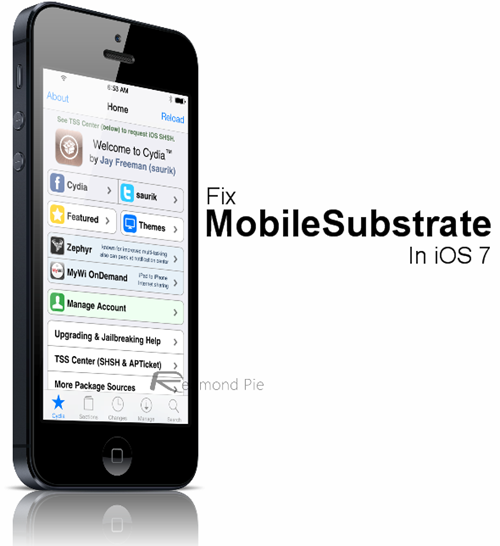 This new fix in question is named “Mobile Substrate Fix” and is available from parrotgeek.net/repo repository only. It requires your device to be jailbroken using the latest Evasi0n7 1.0.1, or have the updated Evasi0n 7.x untether 0.2 installed from Cydia. A7 devices such as the iPhone 5s and iPad Air are not supported by this patch. Though Saurik says things should work fine following this method, he does still suggest simply waiting for an official update to Mobile Substrate. Whether you decide to forge ahead regardless is obviously up to you.